Edmund Crispin has long been one of my favourite Golden Age detective writers, though I’m not sure how popular he is generally as he is a little quirky! I came across his books many moons ago, and fell in love with his style, his eccentric detective Gervase Fen and the whole ambience of his works. Crispin was in reality a composer called Bruce Montgomery, and I only found out recently that he took his pseudonymous surname from one of the characters in Michael Innes’ novel “Hamlet, Revenge!” Oddly enough, one of the characters in that book is also called Gervase! In “Holy Disorders”, Appleby, Innes’ great detective, gets a few name-checks, so obviously there was a mutual admiration society going on here! Crispin’s detective novels are characterised by their unusual plots, literary allusions, joking asides to the reader and many other quirks which make them instantly recognisable. 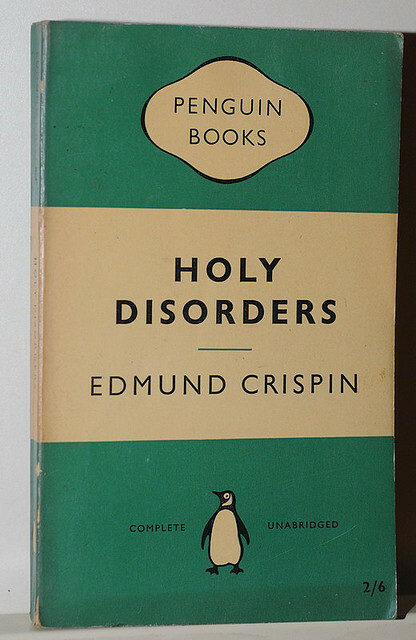 His earlier works are generally considered his best, and “Holy Disorders” was his second, published in 1945. Gervase Fen is an Oxford don who moonlights as an amateur detective. He is larger than life, unpredictable, liable to rash behaviour and very, very funny (as well as being very smart). At the start of the story, which is set in the fictional Cathedral city of Tolnbridge in the West Country, Geoffrey Vintner (based on Crispin, I am sure), a minor composer, has been summoned there by Fen following an attack on the local organist. Vintner has been warned off by an anonymous letter and it soon becomes clear that someone is out to get him – possibly murder him. After encountering and gathering up a vague and unattached minor earl (Henry Fielding – yes, really! ), the two set off for Tolnbridge where it becomes clear that all is not well in the precincts of the Cathedral. This is a marvellous, marvellous book – full of just about everything you could want. It has – murder! spies! romance! witch trials! black magic! ghosts! humour! literary references! You name it, it’s in there! Crispin was a master of his craft and it’s always a joy to read his books. The plot itself, which I won’t reveal in detail, is ingenious and mystifying and the denouement not at all what you might expect. Because the book is set during the War there are elements of German spying and these sit well within the storyline (in much the same way they inform “Hamlet, Revenge!”) There are some genuinely creepy moments which had me a bit twitchy about reading late at night! And the characters are wonderful – Fen, Vintner and Fielding are teamed with the local Inspector (who is a slightly morose type); there are the various denizens of the Cathedral including Garbin and Spitshuker who have regular theological debates; the village locals including a somewhat suspicious pub landlord; and even a rogue don who has escaped from Oxford and is discovered behind a hedge! My favourite part of the book is probably the chapter where Fen and Vintner pay a visit on the gloomy Garbin and on entering his study discover that he has a pet raven. As the scene progresses, our two detective discover that Garbin has a wife called Lenore and has never heard of Edgar Allan Poe! Things go downhill from there, and by the end of the chapter I am always laughing as much as Fen and Vintner – priceless! Crispin is one of those authors I know well and I can rely on. I can just pick up one of his books and dip into without any hesitation and shut out the world around instantly. There are several authors that I feel like this about, and they’re nearly all crime writers – Dorothy L. Sayers (particularly “Gaudy Night”) and Agatha Christie spring to mind. He’s never been as well-known as his Golden Age counterparts but I believe he has something of a cult following, and I rate him very highly. If you want a funny, scary, exciting, puzzling, absorbing read, Crispin is for you! We have a couple of Edmund Crispins in the collection, but not this one – it sounds great! I will have to look out for him. He’s great fun, and very playful with the genre! Your collection sounds wonderful – it must be great to access to all those lovely old books.